The party promised that it would continue with the simplification of the Goods and Services Tax (GST) process by engaging in dialogue with all the stakeholders. It said the purchase of defence equipment would be fast-tracked to strengthen the armed forces, adding that if voted to power, the Government led by the party would continue with its approach of zero tolerance towards terrorism. The security forces would continue to get a free hand in dealing with terrorism, the saffron party said. Asserting that nationalism was his party’s inspiration and inclusion and good governance its mantra, Modi said the BJP’s manifesto aimed to make India a developed nation by 2047, 100 years after Independence. The “Sankalp Patra” (document of resolve) of the BJP had 75 definitive, time-bound targets for the country, he said, adding, “We want people to hold us accountable. Hence, we have set out 75 goals to be achieved by 2022.” The saffron party also promised to implement the NRC (National Register of Citizens) in a phased manner in various parts of the country. About Jammu and Kashmir, it said, “We reiterate our position since the time of the Jan Sangh to the abrogation of Article 370. We are committed to annulling Article 35A of the Constitution of India as the provision is discriminatory against the non-permanent residents and women of Jammu and Kashmir.” “Let us work towards building a strong and inclusive India, whose citizens are assured of dignity, prosperity, security and opportunity,” Modi wrote in the preface of the manifesto. In his write-up in the manifesto, Shah said: “In its tenure of five years, the Government led by Prime Minister Narendra Modi has been able to take many decisions which are historic and has ushered in a comprehensive and fundamental transformation.” He also referred to various schemes and decisions of the Government, including the Swachh Bharat Mission, the Ujjwala Yojana, the Saubhagya Yojana, demonetisation, GST, surgical strikes and airstrikes. In his remarks at the event, the BJP chief said Modi had done justice to every section of the society, with cooking gas connections given in the rural areas, housing and affordable healthcare for all and welfare schemes for farmers. 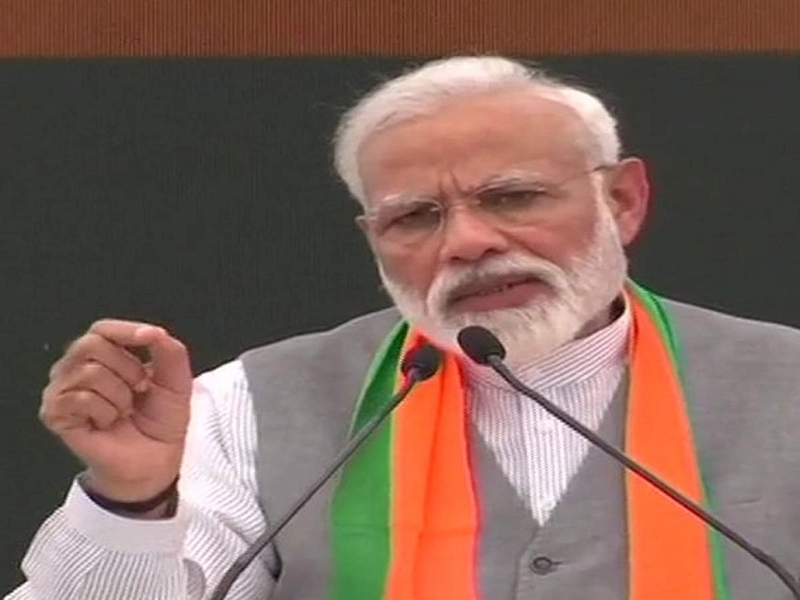 He said the party promised to the people of India a transparent, strong and decisive Government and urged the voters to bring it back to power. “Our ‘Sankalp Patra’ promises to fulfil all expectations of the people,” Shah said. He added that Modi had provided a decisive Government in the last five years and had dared to order surgical strikes and airstrikes on the foundation of terror. With its strikes on terror, the Modi-led Government had sent out a strong message that India could not be taken lightly, the BJP chief said. In its manifesto, the BJP also said it will take all steps to ensure a safe and peaceful environment for all residents of the J&K and make all efforts to ensure the safe return of Kashmiri Pandits, who were forced to leave the Valley in 1990s due to eruption of terrorism. The BJP also said its Government will provide financial assistance for the resettlement of refugees from West Pakistan, Pakistan occupied Jammu and Kashmir (POK) and Chhamb. In its manifesto, the BJP also underscored its commitment to enactment of the Citizenship Amendment Bill, on which it was forced to go slow following widespread opposition from North East states. In a bid to woo the farming community, the BJP announced a slew of measures including Rs 6,000 as annual income support, interest-free loan up to Rs one lakh and pension for farmers above the age of 60 years. According to the BJP’s manifesto or ‘Sankalp Patra (document of resolve)’, if the party is voted to power again, it would invest Rs 25 lakh crore in the next five years in agriculture and rural areas and is committed to bringing down the percentage of families living below the poverty line to a single digit during the same period. The party also said that it would make enrolment under Pradhan Mantri Fasal Bima Yojana voluntary. Home Minister Rajnath Singh said the Bill is necessary for protection of individuals of religious minority communities from neighbouring countries escaping persecution. Referring to protests in North-Eastern States against the Bill, he said his party, if voted back to power, will make all efforts to clarify the issues to those who have expressed apprehensions regarding the legislation. “We reiterate our commitment to protect the linguistic, cultural and social identity of the people of North-East. Hindus, Jains, Buddhists and Sikhs escaping persecution from India’s neighbouring countries will be given citizenship in India,” he said. Many in the North East region believe that such a law will threaten their cultural identity as a large number of immigrants living there will be accorded citizenship. Calling the BJP’s manifesto a “vision document”, head of the party’s manifesto committee Rajnath Singh said the Modi Government was fully committed on nationalism and zero tolerance towards terrorism. Jaitley said the manifesto for the Lok Sabha polls starting April 11 was not prepared with a “tukde tukde” mindset, but with a strong nationalistic vision. The document was rooted in reality, the Finance Minister added. “Our new policy, new doctrine of striking terror at its origin has received global recognition,” he told the gathering. Speaking on the occasion, Swaraj said the BJP was the only party to come up with a “Sankalp Patra” while others came up with “Ghoshna Patra”. “It is not just announcements that the document has made, but pledges that the party has made to itself to deliver to the people,” the External Affairs Minister said. “The country will believe us because we did a lot more than we had promised in 2014,” she added. ASSERTING that nationalism was the BJP’s inspiration, inclusion its philosophy and good governance its mantra, Prime Minister Narendra Modi on Monday said the party aimed to make India a developed nation by 2047, 100 years after Independence. 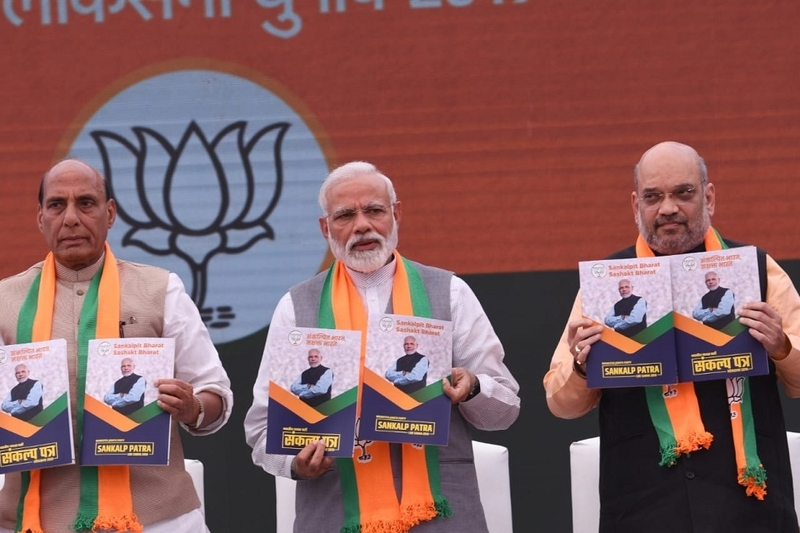 The “Sankalp Patra” (document of resolve) of the Bharatiya Janata Party (BJP) had 75 definitive, time-bound targets for the country, Modi said after releasing the party’s manifesto for the Lok Sabha polls starting April 11. “The manifesto highlights three major points -- nationalism is our motivation, inclusion is our philosophy and governance is our mantra. “We want people to hold us accountable. Hence, we have set out 75 goals to be achieved by 2022,” he added. The BJP manifesto was a “multi-layered and multi-dimensional” document that addressed the expectations and aspirations of all sections of the society, the Prime Minister said, adding that it contained “jan ki mann ki baat”. It aimed to make India a developed nation by 2047, on the completion of 100 years of Independence, he said.